The Great Robot Race Physics and engineering students at Washington and Lee put their creations to the test in the final week of Winter Term. Who will rescue Princess Peach? That was the challenge put to students in the Physics and Engineering Department at Washington and Lee University for their final project. Moataz Khalifa, visiting assistant professor of physics and engineering, and Kacie D’Alessandro, assistant professor of physics and engineering, invited the public to a competition where they could cheer on the robots that the students in the Introduction to Engineering and Electronics classes had designed. Prepping the robot to run the maze. 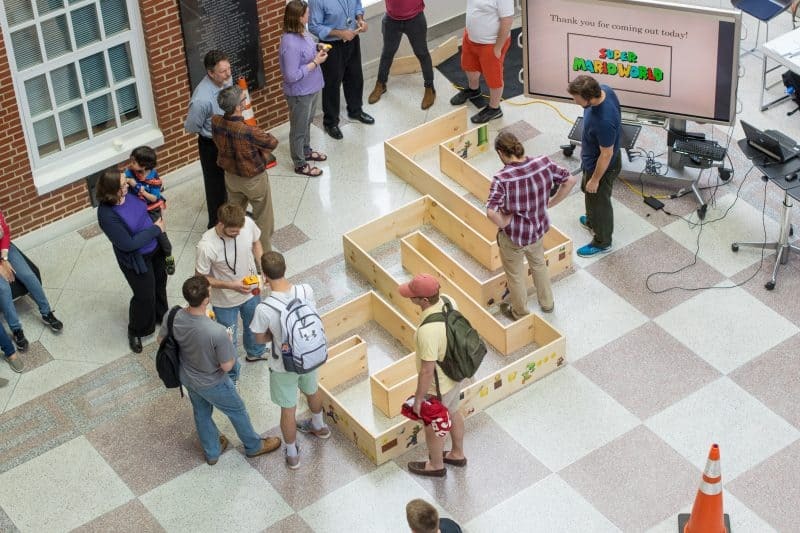 While the engineering students worked on building the robot’s body, using W&L’s 3-D printers in the IQ Center, the electronics students refined their knowledge of analog and digital electronics, including the design, construction and measurement of circuits and programmable logic devices. For those challenges, the robots had to pick up a plastic figurine of Princess Peach (a character in Nintendo’s Mario franchise), then carry her past two physical barriers and up and over a ramp. “I think they all did phenomenally well,” said Khalifa.